Slash-cut style staple with barbs. Heavy .148" diameter by length shown. Type III zinc coating for long life. Suitable for high tensile and all other types of fence installations. Wire slash cut. 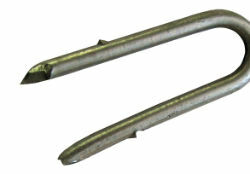 1-7/8" staple. Available in 1 ¾” x 9 ga. and 2" x 9 ga.
Options: 1 ¾” x 9 ga. 2” x 9 ga.